One of the best ways to upgrade your current kitchen is to have custom cabinets made. Many homes have cheap, factory-built cabinets. With the custom-made cabinets, you can radically change your kitchen's appearance for the better. One of the first features someone notices about your house from the road is its doors and windows. Imagine how beautiful your home would look with an intricately carved wooden front door. Trim is a small detail that can either make or break how a room looks. 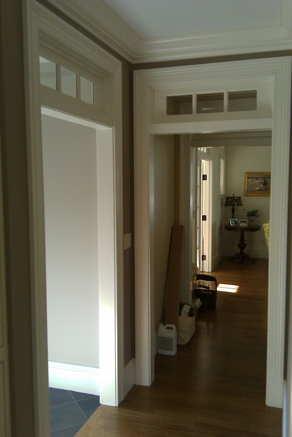 We can do both exterior and interior wooden trim work. Like trim, crown molding and base boards are an often overlooked design detail by homeowners. 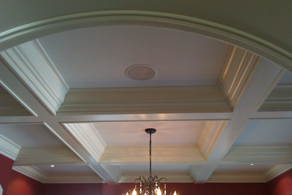 However, for the best possible looking home, professional crown molding and base boards are needed. If you have always wanted an elegant-looking staircase, we can build one for you. Instead of having a wallpapered or painted wall, you could have a beautiful wall with wooden panels. You do not have to settle for standard spackled ceilings. Wooden ceilings create a unique atmosphere. 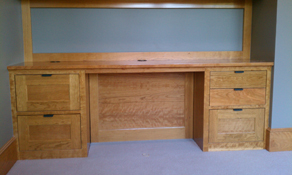 Call us today to learn more about woodworking in Boston. Crown molding and beams on the ceiling.